Dual pedestal heavy duty reels for industrial use. Dual pedestal increases arm support and reduces body vibration. perfect for heavy duty applications. Ideal for truck mount application. 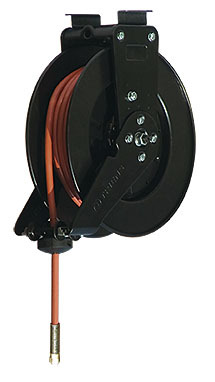 Reels come with Inlet hose and Slide-in mounting bracket for ease of installation. GS I A-350DU PVC NPT3/8"M 3/8"
[10.0] 50.0 203 NPT3/8"M 3.2 18-1/8"
GS I A-435DU PVC NPT1/2"M 1/2"
[13.0] 35.0 203 NPT1/2"M 3.2 18-1/8"
GM I A-365DU PVC NPT3/8" M 3/8"
[10.0] 65 203 NPT3/8"M 3.2 22-3/8"
GM I A-385DU PVC NPT3/8" M 3/8"
[10.0] 85 203 NPT3/8"M 3.2 22-3/8"
GM I A-450DU PVC NPT1/2" M 1/2"
[13.0] 50 203 NPT1/2"M 3.2 22-3/8"
GM I A-465DU PVC NPT1/2" M 1/2"
[13.0] 65 203 NPT1/2"M 3.2 22-3/8"